A LoveToKnow visitor asks, "What causes fear biting?" The answer to this problem depends on each dog's individual circumstances. Share this story. Question: What Causes Fear Biting? I have a question about fear based biting in my two-year-old dog. We got him from a shelter at seven weeks old; he seemed a bit shy and nervous, but nothing too extraordinary. He is a Lab/Border Collie/Australian Shepherd mix. He didn't bark until he was almost a year old, and that is when his entire behavior started to change. One day, a friend of ours came over. At first, the dog was wagging his tail and happy to see him, but when our friend put his hand out to pet him our dog instantly attacked and bit him, breaking the skin. I'm ashamed to say, this has now happened numerous times with the exact same situation every time. After he bites once, he runs away and cowers. When we find him, he is literally shaking and terrified. He has never even remotely growled or shown any type of aggression towards anyone in our family. He is a sweet and loving dog for the most part, and we have never had any problems with him within our immediate family. He is also absolutely terrified of anything and everything whether it be a cell phone, an umbrella or even his own food dish. If it comes near him, he runs away and cowers. We have tried seemingly everything to fix the problem, numerous dog trainers and obedience classes. We now have him wear a muzzle whenever strangers are around, but obviously this is not a permanent solution. He is only two and we can't go through another ten years just hoping that no one ever comes over unannounced. Whenever he is around people with the muzzle on, his initial reaction is a growl and then after he sees they aren't going to hurt him, he calms down and is completely submissive. He is much more calm with the muzzle on. I would really appreciate any help you can give us. Our entire family absolutely loves this dog, but we can't run the risk of him severely hurting someone someday. Is he too old to rectify this behavior? I agree with you that you have a potentially dangerous situation on your hands, and I'm sorry to hear about it. It honestly sounds as though your dog had a bit of an uncertain temperament right from the beginning. Some puppies are just born this way, others develop the behavior based on circumstance. Normally, I'd recommend that you begin with a program to socialize your dog so he would better accept changes in his environment. However, you've already given that a try through the trainers and obedience class, to no avail. So, I'm recommending another route. Have you discussed this problem with your veterinarian? I have two thoughts in mind. A hearing loss would tend to make your dog feel spooked at sudden movements. Aussies and Border Collies are bred to nip at sheep while they herd, so nipping is an instinctive reaction with them. 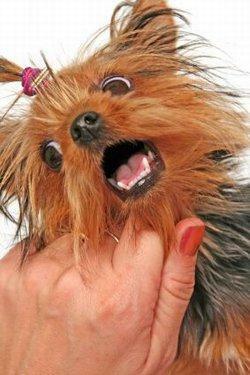 Add your dog's fear to the mix and you get the outright biting. A vision loss could also result in the kind of startled reaction your dog displays, not just to people but even to the simple movement of his food bowl. If your vet is able to diagnose a physical cause behind the behavior, it will give you a better idea whether there is anything you can do to break the biting habit, and overcome your dog's fear issues. I truly hope for the best in your situation. Thank you for your question.